← Kudos to Office Depot! Instead of writing a fourth book in the flying broomstick series, I’m redirecting my thoughts to a “full-blown” fantasy novel, complete with a fantasy world. The working title is The Unexpected Traveler and it will have the usual elves, dwarves, dragons, and occasional talking animals. I think I’ve got some cool twists and I’ll be blogging about it as I write. One cannot write of elves and such unless there is some special language in which they write. Now my elves are not Tolkien’s elves and don’t have nearly as pretty a script, but surely elves don’t use roman characters! 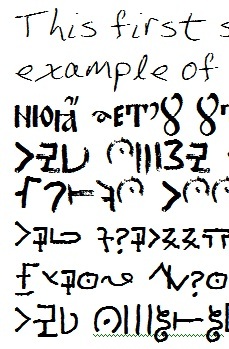 I looked around the Internet for runic and other interesting fonts, but nothing comes up other than various attempts to duplicate what Tolkien and others have already done. And given they own those fonts, I can’t use them. What to do turns out to be simple. Why not design my own font? Is there software that makes that easy? Yes. The one I found is called Scanahand (as in ‘scan a [sample of your] hand[writing]’). Mind you, so far I’ve only been playing with it. But the image shows some things Scanahand can do. The first two lines are simple. I printed out the template that Scanahand provides, then I printed characters on it in the appropriate squares. This I scanned (hence the name of the software). The software converts this to a font file and installs it on the computer. What you see is what Word looks like when that font is selected. The third line is a bit more interesting. A scan is an image, after all, so I scanned a page from an old book I found at an antique store. As near as I can tell, the font is something called “Church Slavonic.” I used image editing software to copy characters from the high-resolution page scan over to the Scanahand template. No scanning was needed this time–Scanahand takes the image as input. Mind you, I have no idea what these characters are, so I assigned them to keyboard letters quite randomly. The fourth line and fifth lines represent my first attempt at a glyph font. I learned quickly that using a mostly-dry marker to create characters results in stuff that’s pretty ragged, but when ragged glyphs are called for, they’re available. The last three lines were a more serious attempt at an elvish alphabetic glyph font. If you remember the Sherlock Holmes story of the dancing men, it should be easy to decipher into English text (and Word thinks it’s English text, hence the wavy-green underline questioning my grammar). I created different glyphs for upper and lower case letters, plus new glyphs for punctuation. That may make it harder to decipher. In my mind that last font seems pretty “practical” as opposed to “beautiful.” For Tolkien, the elves had beautiful everything. My elves are more practical, but I think they still deserve a more flowing script. Oh, and there are the dwarves and dragons and fairies. The possibilities are endless. You can read more about Scanahand here. This entry was posted in Fantasy, Fonts. Bookmark the permalink.